One of the most timeless wardrobe staples is definitely a silk blouse, and we don't talk about them enough. Wearing a silk blouse is one thing, but styling it is another. Today, we are here to break down a few of the coolest ways to style a silk blouse, courtesy of some of our favourite fashion girls. Whether you are headed to the office or searching for that last-minute look for a night on the town, learn to let the silk blouse become a major workhorse in your wardrobe. Not sure how? The outfits ahead will give you all the pointers you need. Go on to see eight fresh ways to style a silk blouse, and then shop a selection of our favourites. Style your favorite silk blouse with vintage denim and simple heels. Layer a basic T-shirt underneath your silk blouse and throw on a midi skirt. Your office outfit has never looked cooler. Pair two pastel colors together to create a fresh take on this classic blouse style. Layer multiple pendant necklaces together when your silk blouse needs a little extra pizzazz. A silk blouse looks great when styled with leather. We love this miniskirt-and-loafer outfit for a fresh take on an all-black summer look. Opt for a monochromatic ensemble, but play with different hues within the same shade. Go all out and pair this classic shirt style with festive pants and chunky shoes. A colorful faux-fur coat won't hurt either. Take things back to the basics with this timeless, office-appropriate look consisting of a blazer draped over the shoulders and some bright-red pants. Polka dots are having a major moment right now, and with this top, so can you! The draping sleeves and wrap-around cut will cinch perfectly around your waist. 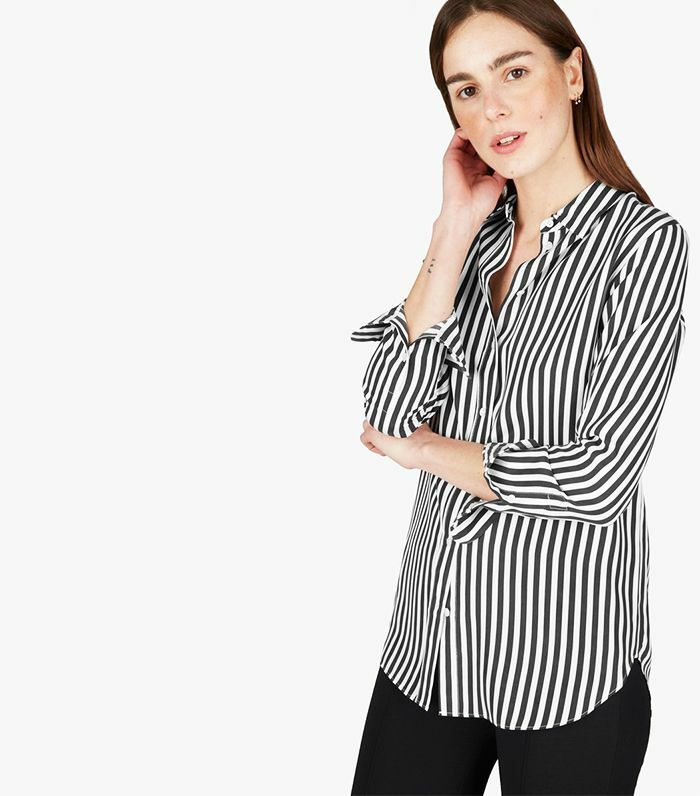 Everyone needs a versatile vertical-stripe button-down. Inspired? Follow us on Pinterest.